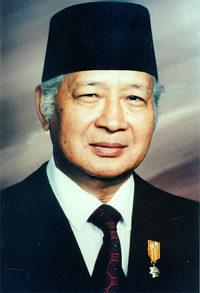 Suharto (February 20, 1921 – January 27, 2008) was an Indonesian military and political leader. He was a military officer in the Indonesian National Revolution. He is better known as the second President of Indonesia. He held the office for a long time, from 1967 to 1998. Suharto seized power from his predecessor, the first president of Indonesia Sukarno. For this, he used some force, but also took some political maneuvers. At the time, there was instability and unrest inside and outside of Indonesia. This helped him come to power. He took three decades to change the regime to work along militarist lines, with a strong central government. His movement was known as "Orde Baru". As he took an anti-communist position which he could defend, several Western governments supported him both in economic and political matters. This was during an era that is known as Cold War. For most of his three-decade rule, Indonesia experienced significant economic growth and industrialization. His rule, however, led to political purges and the deaths of millions of suspected Indonesian communists and Chinese-Indonesians. He also made some laws against communist parties and ethnic Chinese. His New Order administration's authoritarian and increasingly corrupt practices led to much discontent in the 1990s. Suharto's almost unquestioned authority over Indonesian affairs slipped dramatically when the Asian financial crisis lowered Indonesians' standard of living. People inside the military and other institutions no longer supported him. There were some problems inside the country during the early 1990s. Suharto became more and more isolated, in a political way. After mass demonstrations in 1998, Suharto was forced to resign. Suharto had been the face of Indonesia for over 30 years. After retiring, he lived in seclusion. There were people who wanted to try him for genocide. This failed however, because he had a very bad health. His legacy remains hotly debated and contested both in Indonesia and abroad. Like many Javanese, Suharto has only one name. In contexts where his religion is being discussed he is sometimes called Haji or el-Haj Mohammed Suharto, but this Islamic title is not part of his formal name or generally used. The spelling "Suharto" has been official in Indonesia since 1947 but the older spelling Soeharto is still frequently used. Suharto died January 27, 2008, at 1:10 P.M. local time due to organ failure. He died at Pertamina Hospital in Jakarta, Indonesia. He was taken off life support. He was buried at a family mausoleum near Solo town. ↑ "Indonesia ex-leader Suharto dies". ↑ Miguel, Edward; Paul Gertler, David I. Levine (January 2005). "Does Social Capital Promote Industrialization? Evidence from a Rapid Industrializer". Econometrics Softare Laboratory, University of California, Berkeley . ↑ Robert Cribb (2002). "Unresolved Problems in the Indonesian Killings of 1965–1966". Asian Survey 42 (4): 550–563. http://links.jstor.org/sici?sici=0004-4687%28200207%2F08%2942%3A4%3C550%3AUPITIK%3E2.0.CO%3B2-J. ↑ Leo Suryadinata (1976). "Indonesian Policies toward the Chinese Minority under the New Order". Asian Survey 16 (8): 770–787. http://links.jstor.org/sici?sici=0004-4687%28197608%2916%3A8%3C770%3AIPTTCM%3E2.0.CO%3B2-3. ↑ Jakarta, Mark Forbes Herald Correspondent in (28 January 2008). "Strongman Soeharto dies without ever facing justice". The Sydney Morning Herald. ↑ Watson, Richard C. Paddock and Paul. "Indonesian ex-president Suharto dies". baltimoresun.com. This page was last changed on 3 April 2019, at 01:31.